Sample movie showing the features of PV Feather in action. "PV Feather is a major breakthrough and allows us to do complex per-vertex feathering directly inside After Effects instead of having to jump into other compositors or dedicated rotoscoping applications. PV Feather is now an indispensable tool in our toolbox." "Wow, we've needed something like this for a long time. PV Feather has made my life much easier." "Though After Effects has a powerful and usable masking toolset, PV Feather instantly simplifies my work flow. It's another 'Must Have' from RE:Vision Effects." PV (Per Vertex) Feather performs feathering by using an inner mask for filling, and an outer mask for feather control. The distance between the inside and outside mask controls the amount of feather. Variable feathering controlled by inner and outer masks. 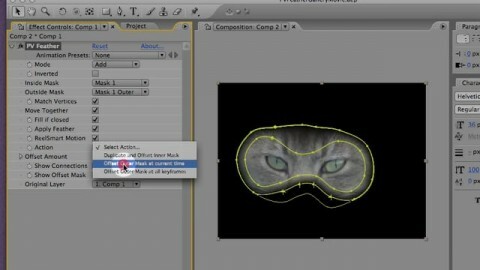 AE's own mask primitives are used, so there is no new spline or keyframing interface to learn. Option to use ReelSmart Motion Blur like integration on matte produced (instead of AE's multiple time sampling method). You can even use AE motion blur shutter and angle settings. Installed plug-in will work with After Effects CS5 (and up).